If I can just move this button, I’ll get that second breakfast in no time! Disclaimer: A complimentary sample of this product was provided for my honest review. Chubby dogs, hold on to your kibble – you’ve met your match. Jim Foley invented “Did You Feed The Dog,” a product that answers that very question. Slide the appropriate button after each feeding, and everyone in your household will stay in-the-know about your dog’s meals so he’ll no longer get away with double dinners. I received a “Did You Feed The Dog” for free in exchange for my honest review. 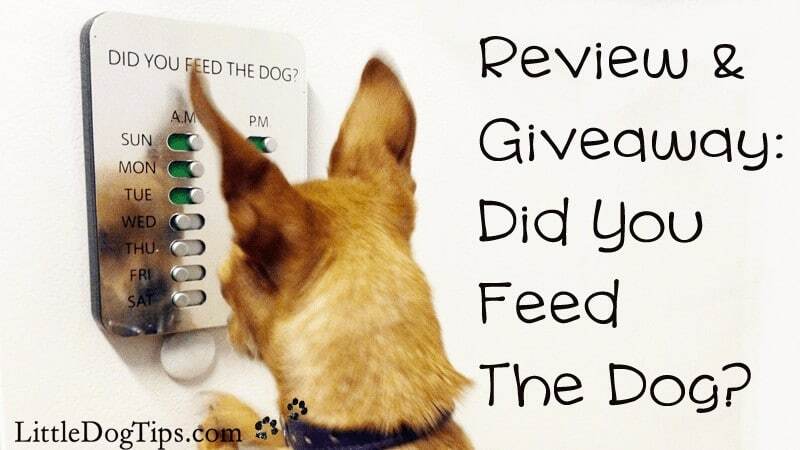 Did You Feed The Dog (DYFTD) clings to your refrigerator or sticks to your wall with the included magnet strips and sticky pads. It requires no batteries, no WIFI, no technology at all. 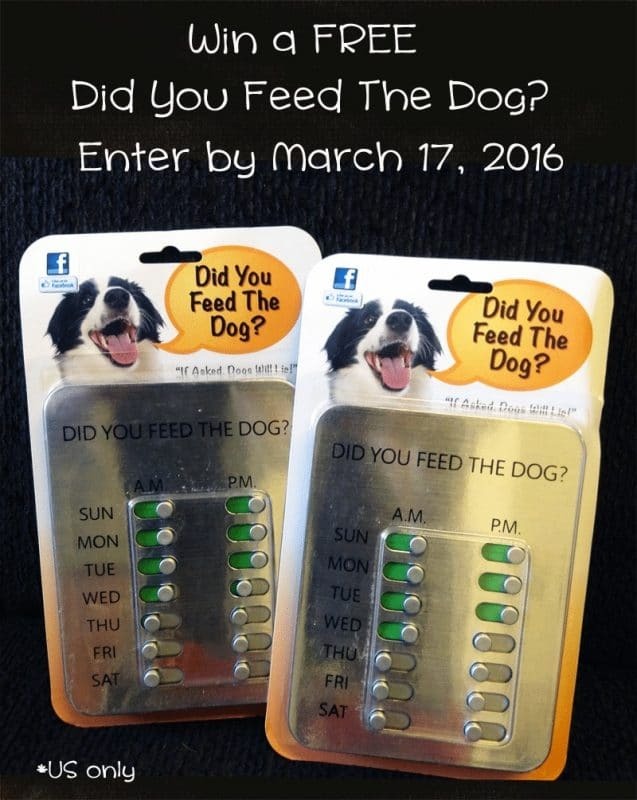 Every time you feed your dog, you slide the button for the time and day. This reveals the green part of the slider to indicate that the dog has had that particular meal. That way, everyone in your household can tell if the dog has been fed. Because, of course she does – she’s a dog. Being on a night schedule made it difficult for me to keep track of regular feedings for my dogs. It seemed unfair for my dogs to have to wait for a late brunch, when we would wake up in the afternoon. So, I was free-feeding: I added food to their bowls whenever I saw them empty. If we were going to be away from home, I’d just overload the bowl with kibble. This was convenient, but it’s not always the best way. Matilda and Cow became accustomed to late mornings. They snoozed through the dry California heat, and ignored their full bowls until much later in the day. Other times, though, they ate early. Our feeding schedule was a mess. I felt guilty when I saw an empty bowl and wondered how long they had been out of food, and wasteful when uneaten food would attract bugs, possibly germs. Regular feedings were an effort to stick to at first, but it made my life easier, and DYFTD helped. Now, my dogs are more interested in their food during mealtimes. They eat most of it in about 15 minutes. It was also easier to adjust portions around training sessions so they wouldn’t overindulge. Their potty schedules also became more predictable. I like not having to charge up yet another device or buy some obscure type of batteries. The DYFTD is made of high impact ABS plastic with a silver brushed-metal finish – it’s attractive on the fridge, and makes sense in a kitchen. It doesn’t feel out-of-place. I like sliding the buttons. Clack. Click. Clack. Very satisfying. It’s simple, but it serves a lot of purposes, other than foiling the plots of deceptive fourthmealers – it also prevents missed meals and could be used to communicate with your pet sitter or dog walker. In order for it to work, you have to flip a switch every time you feed your dog – and your family members need to use it, too. It took me a few weeks to remember to consistently use DYFTD. It didn’t stand out on my fridge. I think it’d be perfect if it had a timer or alarm of some kind. There would be a more complicated, technological factor, but it’d be easier to remember to use it. Getting a chance to make that clack sound motivated us to stick with it. Another drawback is, if you feed your dog more or less than twice a day, you won’t be able to use this. Most adult dogs should eat twice a day, but puppies need up to four meals. My dogs eat twice daily, so this wasn’t a drawback for me. The magnets that come with DYFTD aren’t very strong, so it would slide down my fridge instead of staying in place. I just set it over another kitchen magnet, and it works fine. I discussed this with Foley, and he tells me they’ll have stronger magnets in the next production run. The sticky squares work fine for wall mounting, however. Who Should Get A DYFTD? Overall, I find Did You Feed The Dog nifty. It does exactly what it says it does, it looks nice, and it’s enjoyable to use. The best place to purchase a Did You Feed Your Dog is on Amazon. I’m also giving away 2 DYFTDs to entrants in the United States. Enter with the Rafflecopter thingy below – feel free to contact me if you have any problems or questions about this giveaway. This seems like a good idea for a pet that is fed by more than one person in the household. Miss Edie is only fed by me and her food is divided 3x a day. I think this is a great idea and would love to use it to keep everyone organized! I think the DYFTD could also be great to use if you had multiple people taking care of your dogs while away. Sounds like a great idea if people in the household will use it consistently. I have seen this and think it would be great for families where more than one person feeds the dog. This is a super idea. I can use this for sure. Neat product. Definitely a plus for people on different schedules. This could be really useful for people who are forgetful or have several people feeding the dog. Great idea for a pet ,I can use this for sure. Kia recently posted…Featured on The Pet Buzz Radio Show! That really is a nifty tool, perfect for multi person households! Thanks for sharing. Very clever! We split feeding responsibility here with my daughter and her husband feeding typically the PM schedule and I have the AM. I can see how this could help me as I’m always asking “Did you feed the dogs? !” 🙂 Great review! Spencer the Goldendoodle recently posted…Dog Park Fail! It is a good idea for some households. I have dry dog food down all the time, as 11 dogs eat at all different times. Wow! Great idea! We are always asking each other if the pups have eaten yet. Smart! This is so amazing my husband and i are always asking each other have you fed the 3 dogs all the time so this would help with that problem. I think this is a great idea! We could use it most for our new kitten since I’m always asking my bf “Did you feed her yet” because our work schedules are so different. This would be wonderful to have! Seems like a neat product! I think it’s a really good idea. I think its a good idea for busy households. My daughter would like it.